Thoughts and prayers go out to the more than 1 million people under Hurricane Irma's forced evacuation orders. I'm in the "cone of uncertainty," although at 60 miles inland not as worried as those on the coast. The storm reminded me, however, that there are some times when it's great to be photographing weather. This deadly tropical cyclone isn't be one of them, though. Hunker this one out if you're in the path and evacuate if ordered. When more routine storms arrive later, grab the gear and head outside. I'm not the world's foremost expert at photographing weather, although I can share some inexpensive basics. Storm chasing is a specialized pursuit that takes a ton of time, study and the willingness to drop everything at a moment's notice. It's kind of like the 12 years I did search and rescue work—pages 24/7, always in dragon-breath-stinky conditions. My old friend Scott Wood does a great job capturing Mother Nature's raw power. Visit his website for some stunning work and tips as storms swirl into the Northwest. PetaPixel also has a great article on the subject. Don't let that expensive gear list get you down, though. It's mandatory when you're making a living taking those pix, but if you dabble like me a sturdy tripod, decent camera and a flashlight are about the only requisites. Safety is a prime consideration. Most of the rules are the same as anytime you're outdoors in a storm, but camera gear adds potentially dangerous new elements. Metal and lightning are like chocolate at a weight watcher's meeting. Your tripod probably won't be touched, but if it is and you're anywhere around...the stampede will be electric, at the speed of light and deadly. Those sturdy legs in the moist soil make an attractive ground, especially when wet. 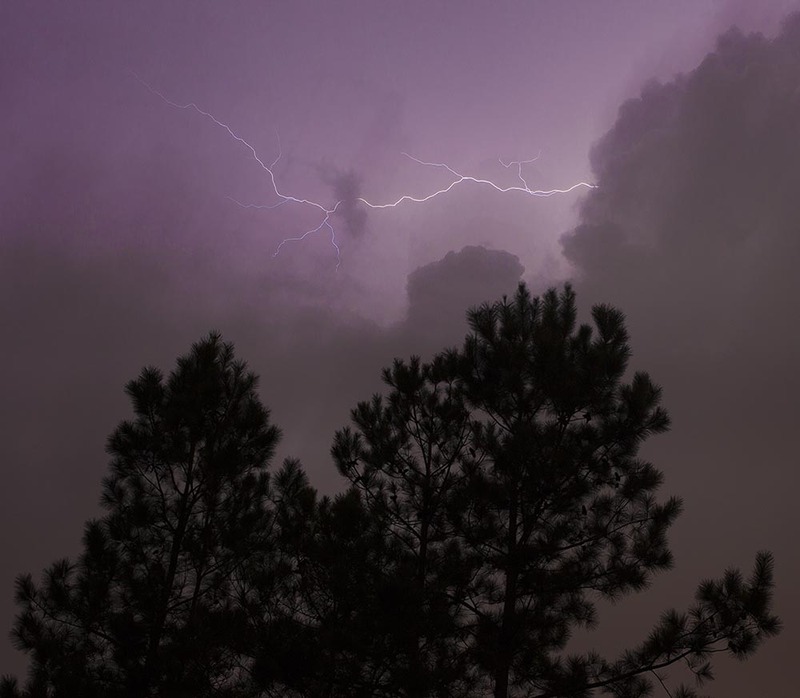 Take lightning photos at a "safe" distance from an electric storm. If it's directly overhead the odds are good a pouring rain will muddy the image, anyway. Read this document (PDF) from the National Outdoor Leadership School before you even try photographing weather. It has great tips on lightning and how to avoid becoming a statistic. Stay out of washes and riverbeds. Flash floods are deadly and tunnel vision through a viewfinder doesn't let you see approaching threats. You might hear one coming, but probably not in time to escape. And if all that isn't enough to convince you to stay inside, ask the Wicked Witch of the East about flying debris. Her 1939 demise remains a classic. Use a tripod. A few years ago I purchased a lightning trigger on sale from BHPhotoVideo.com, where I buy all my photography gear. It works, but not really well. A sensor on the unit triggers the shutter as the lightning flashes. It's too late to capture the initial light, but according to the manual, most strikes have a follow-up shortly after. Makes sense, but I've have better luck pointing my camera at the storm and opening the shutter for long exposures—hence the need for a tripod. Flashlight, because it's waaaayyyy easier to do this at night. Gallon-sized baggies to protect gear if you're nuts enough to stay out in the rain (not highly recommended). Set the camera on the tripod and dial it for a timed exposure—where you can hit the shutter button, run in front of the lens and be part of the family photo. Go full manual and use a long exposure time. Dial the F stop down until things are dark, black. Lightning will add light, in some of the exposures, hopefully. Use the flashlight to manually focus at infinity. You are some distance from the strikes, right? The camera won't focus well in the dark (if at all), hence the disabling of autofocus. Point it in the general direction of the light show, hit the shutter and wait. Once it's exposed, do it again, over and over until you're really tired of the routine or the storm forces you to abandon the session. Don't automatically delete photos just because you don't think you caught anything. The image you see here—which isn't that great—was the only one I salvaged from this week and I didn't think I caught a single lightning strike. So take a close look before sending them to the trash. Oh, and you are taking your images in RAW format right? Depending on distance and rain between, that's the best way to save/initially edit when your photographing weather. Even snow presents some unusual challenges....so set it to save RAW, and leave it there. Glass is critical, and because distance is your friend, I try to stay with Canon's L series in telephoto options. The 70-200L F4 non-stabilized version is my favorite (on the tripod you have to turn off the stabilization, anyway). If you want to learn more about lens options, here's a great reference from James Williams, editor at TopProbe.come.